My youngest nephew at home has been struggling with on and off fever. We thought it was only due to the extreme weather condition, but whenever fever exists, I get too cranky that it could be due to infection. Last time, he had fever was because of his cough. He did well alright but his running nose won't subside. 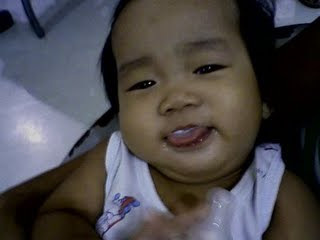 Now, he has fever again and my mom can only bring him again to his pedia. Our house helpers say he has anemia since I had no chance to confirm this with my mom. Reading about anemia did not make sense at all. Sometimes, I think that his frail condition was brought by insufficient prenatal vitamin or something. We only wish he gets better after his medications since he gets too grumpy when he is sick and that only drives us crazy.